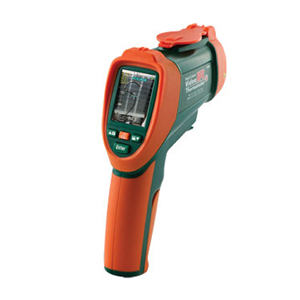 The OS-VIR50 video infrared thermometer is capable of making non-contact (infrared) and contact (thermocouple) temperature measurements. The built-in camera offers still image and video capturing functionality for documenting measurement locations. The meter includes a microSD card slot for offloading still images and video. The built-in laser pointer increases target accuracy while the backlit LCD and handy push-buttons combine for convenient, ergonomic operation. This meter is shipped fully tested and calibrated. Note: Comes complete with 2 GB microSD card, Type K bead wire probe, USB cable, rechargeable 3.7V battery, carrying case and operator’s manual.